she is seeking CAS Christmas cards with ornaments! I tried the Jennifer McGuire's Dimensional Sentiments technique with this card. I really like how it turned out. Stop by the CAS Christmas Card Challenge and check out all the beautiful, festive inspiration by the rest of the team. 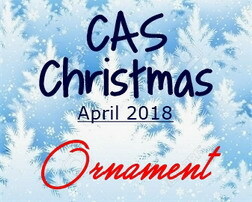 Then play along with us, you have until April 24th to link up your CAS Ornament Christmas card! 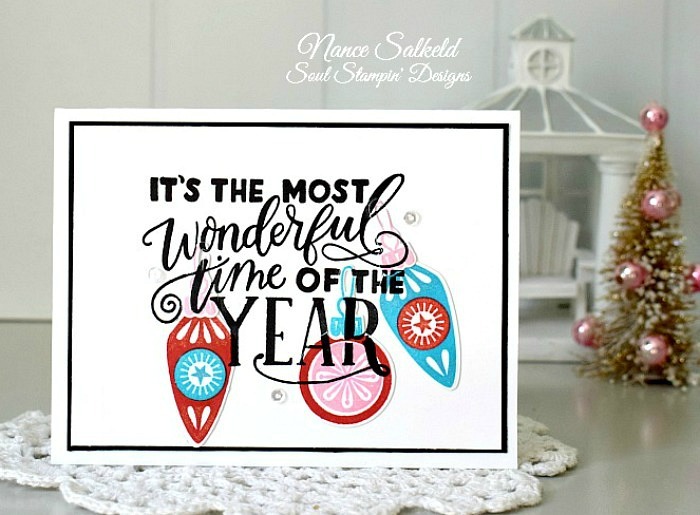 Stamps: It's The Most Wonderful Time - (Catherine Pooler). Paper: Neenah solar white 110 lb; Midnight (Catherine Pooler). Ink: It's a Girl, Rockin' Red, Fiesta Blue & Midnight - (Catherine Pooler). Extras: Ornament dies -It's the Most Wonderful Time, (Catherine Pooler); Clear sequins (Pretty Pink Posh). Love that sentiment that takes the stage, Nance! Your ornaments are so pretty with it! Love the colors! Love those awesome retro-looking ornaments in the great colours! And a great layout with the way you added the sentiment!